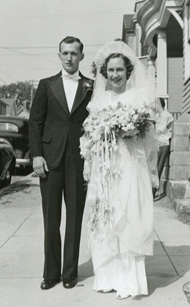 Rita Patricia Smith (daughter of John Smith Jr.) married Raymond R. Gosselin on June 21, 1941 at Holy Name Church, New Bedford. Rita's sister Louise was the bridesmaid and Raymond's brother, Jean was the best man. She was 23 year old and he was 25. A beakfast was held at the New Bedford Hotel followed by a reception in the home of John Smith Jr. Their honeymoon was an auto trip to the White Mountains and Montreal. They were married 57 years. They lived at 114 Park Street before buying their home on Liberty Street, New Bedford. They had 2 daughters, 5 grandchildren, and 9 great-grandchildren. Born Rita Patricia Smith in New Bedford on May 10, 1918 and died in New Bedford on July 4, 2008. She was delivered at home as was the norm during this period. Born in New Bedford on August 15, 1916 and died in New Bedford on March 23, 1998. Isaie Gosselin was born in Alexandre, Province of Quebec, Canada on August 14, 1879 and died in New Bedford on July 3, 1942. Mr. Gosselin (age 31) married Mrs. Gosselin (age 31) on September 20, 1910 in ???. They had ? children (? daughters and ? sons) and ?? grandchildren. Born Selfride Houle in Alexandre, Province of Quebec, Canada on November 11, 1879 and died in December 4, 1954.